When you have moved as much as my wife and I have, you get used to dreadful customer service. Moving requires you to call your cable company, telephone company, utility companies, and any other company that requires a physical mailing address. Because a lot of their customers move at some point, these companies typically have a special workflow for people who are moving. Utility companies do this very well. You can call and select the “I am moving” option on the phone menu. Then you talk to an operator who will remove your name from your existing account and help you set up your new account if it is in a serviced area. Utility companies understand that moving is a difficult experience at best, so they make changing utility accounts as simple as possible. Of course, customer service is getting a very bad name in the world. I had an interesting experience with our phone company. We had phone and internet service accounts with them.The first problem I encountered was the phone menu. In order to get to a person that can help with “canceling or transferring service”, I was in phone menu hell for 4 minutes. I did not make any mistakes, and I had my bill so I could enter in the account number. I was also not trying to get to some obscure option, as canceling the service should be readily available. Instead I had to get through a ridiculously long phone menu of 3 different levels. Once I successfully traversed the menu, I then had to wait on hold for 15 minutes to get an actual person. The conversation with the customer service team was difficult because of the nature of my request, so I was OK with talking through the issues over a long period of time. But the human part of the customer service was very good, much to my surprise. If you are a regular reader of this blog, you know that I may not make my point right up front. As usual, this is one of those times where it is taking me a bit to get to the point. I will get there, I promise. In most customer service organizations there are multiple levels of representatives. The first level are the people that ensure the customer is not an idiot. Disappointingly, these representatives typically lose their cheery demeanor after the first month on the job. In one case with our phone company, we received a bill 2 months after we had canceled our account. I called customer service to rectify the issue and was met by one of the more obnoxious representatives I had dealt with in a long time. I argued with the person for only 5 minutes, but she insisted I was being billed correctly, because they bill for one month in advance. I argued that we had canceled the account more than a month ago (I later found out it was 2 months prior) and that we were being incorrectly billed. She started getting all cranky with me and that is when I screamed at the representative and not so politely asked for a supervisor. I have very little patience for ignorance, especially when you are ignorant and arrogant about it, so I got a little upset. This is a very good example of ugly customer service. If you are providing a service to the customer, you had better be able to provide proof that the customer is wrong. The supervisor on this call, immediately apologized that anything went wrong as my account clearly stated the account was supposed to be closed 2 months ago. After several minutes, all of my billing issues were taken care of. Good customer service is worth its weight in gold. Because the supervisor provided good customer service, I did not immediately rant about the situation on this blog or put terrible reviews on various consumer related sites. The good customer service had resolved my problem, so it generally outweighed the bad. And now we get to the point. For a technical company, bad customer service can be a real problem. Dell has spent the past few years getting around their terrible customer service problems. The service is getting better, but it does take some time to rehabilitate a bad reputation. Good customer service can make an OK company look like a fantastic company. A good example is the blog comment service segment. There are several services available, but it is a two horse field at this point with Disqus and Intense Debate. Why are only two services really being considered? In reality it is not because of their initial products. Disqus required third party hosting of your blog comments. This was a big problem for a lot of people, but Disqus worked directly with some bloggers to resolve the issues. You can contact them through email or Twitter and they respond fairly quickly. Intense Debate has similar stories as well. Because of the fantastic level of customer service from these companies, they have become the standards for blog comment services. One industry segment that always has mixed reviews is hosting services. I am thinking of services like DreamHost, GoDaddy and others. Invariably, you hear stories of fantastic customer service and dreadful customer service. In that segment, the customer service is not a differentiator because people have so many mixed experiences. 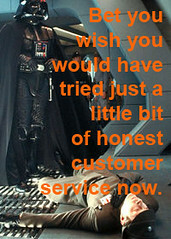 I have not had any bad customer service issues with my hosting provider, but I know other people who did have problems. Overall, good customer service can be hard to find. In some industries, the services provided are basically the same between companies, but one company is considered to be the best because they have fanatical customer service. Yes, customer service can make the difference between a company being the gold standard and an also ran.